Construction Project | Commercial Building | Heavy Constructors Inc.
Based out of Rapid City, Heavy Constructors, Inc. is deeply invested in the past, present, and future of South Dakota and its construction industry. 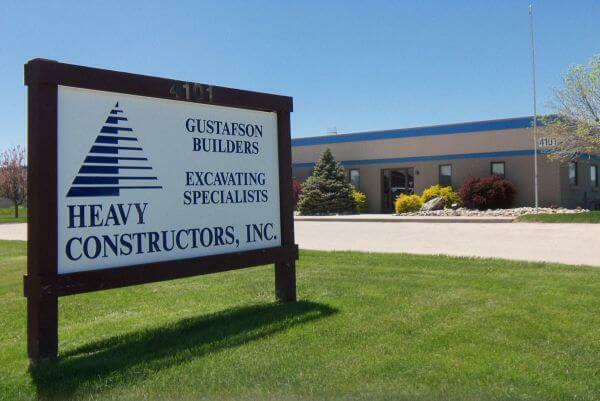 Since 1919, the Gustafson family, founders of Heavy Constructors, Inc., has been at the forefront of construction projects that have led to significant progress and lasting relationships throughout South Dakota. With a wealth of experience and a dedication to our community, Heavy Constructors, Inc. brings the professionalism, safety measures, and work ethic needed to complete every construction project to the highest quality. With over 95 years of experience, Heavy Constructors, Inc. is your expert in construction. Heavy Constructors, Inc. and our divisions, Gustafson Builders and Excavating Specialists are here to meet all of your construction needs. We are committed to offering comprehensive services that hold client satisfaction as a number one priority. We also offer construction management services to achieve a seamless, cohesive construction project that ensures success. Founded on traditional family values, truth, honesty, and employee commitment, Heavy Constructors, Inc. is dedicated to the art of construction and the positive results the industry brings to the local economy. The employees of Heavy Constructors, Inc. look forward to working with current and future clients to achieve excellence in the construction industry and the development of our community. If you’re ready for a quality, professional, comprehensive construction project, call us at 605-342-3152 or click here to contact the building experts at Heavy Constructors, Inc. today!